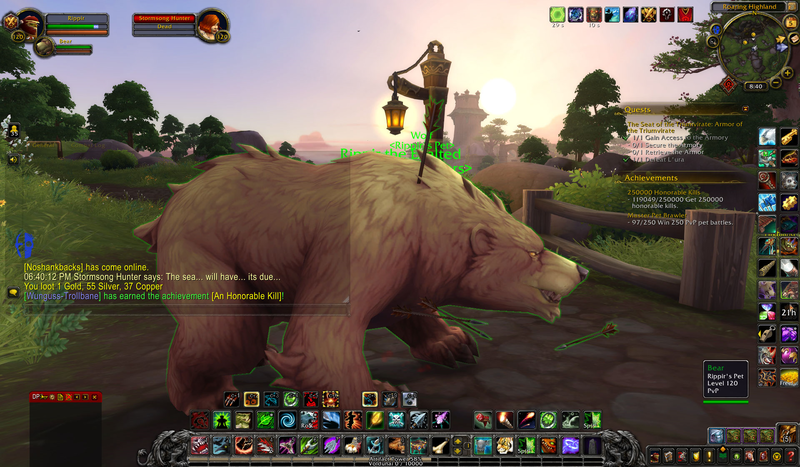 Here's a list of known (or suspected) bugs related to hunter pets in BfA. Do you have any to add? Nothing serious, but two saurolisks have trogg portraits after being tamed. This is because they had trogg riders before taming (the trogg falls off and dies when tamed) and the NPC seems to have been treated as a trogg, despite the saurolisk beast being the primary model. They are: Mugg (127290) and Grimestone Handler (127203). Shale Crawler (126749) currently has no classification and so can't be tamed. I accidentally left this one off the list originally. Frenzied Pterrordax (113040) (Emerald Nightmare Raid) should be classed as a Beast. It's currently classed as an Elemental, which is almost certainly a mistake, despite being flagged in the Pterrordax family. It's a grey classic pterrordax, which is currently not available on a tame. Dreadtick Latcher (134057) in Nazmir. It should probably also use the regular bloodtick model rather than the lower-res critter one, since it's used as a regular creature. Note that this is a different ID to the nearby tameable Dreadtick Latchers. Brinebeak Albatross (136914) should either be made a Bird of Prey, or switched to be a vulture and renamed. They're tameable minions of Nestmother Acada, who is a vulture not an albatross. Note her young are named "Brinebeak Hatchlings" but are now vultures as well. I think the entire vignette was originally a bunch of albatrosses on the beta, but was only half converted to being vultures instead. I accidentally left this one off the list originally. Dreadtick Latcher (134057) in Nazmir. It should probably also be classed as a Beast and flagged tameable. Note that this is a different ID to the nearby tameable Dreadtick Latchers. The pair of Brinebeak Albatrosses (136914) that follow Nestmother Acada, as if they're her minions, perhaps should also be changed to use the vulture version of the model, since she's no longer an albatross. Shadowclaw (149663 and other IDs) should probably use new nightsaber2 model, with nightsaber2purple skin, to match the mount it can drop. Currently it uses the broken isles saber model, which seems like a placeholder. Bore Worm (68221) was the only old larva that wasn't updated to the new larva2 model. It wasn't tameable, but worth noting that it seems to have been missed. These two in Pandaria are being ridden by Zandalari and could maybe be updated to the new mount model instead of the new wild one. It's too big to just paste here. I omitted anything that is (i) friendly to both factions, (ii) friendly to one faction and in an area (city, town) belonging to that faction, (iii) clearly meant to be some other NPC's pet or under their command, (iv) part of a boss fight, (v) part of Island Expeditions (IE beasts are definitely not meant to be tameable). Void stalker family – wrong spec? Two pet families are missing their special ability: Direhorns (Gore) and Basilisks (Petrifying Gaze). The two new raven skins -raven2_black and raven2_white (but not the original from Legion) have patches missing that result in some glaring texture issues with their backs. Reference thread: http://forums.wow-petopia.com/viewtopic ... 60&t=25614. Alash'anir (148787) should be Beast - Chimaera, not elemental. Glimmerspine (149654) classed as a Humanoid instead of Beast - Crab. It's level 121 but could be flagged tameable for next expansion. Trained Saurid (58071) and Fierce Anklebiter (69244) should be classed as raptors. Shallows Crawler (147748 and 147738) should both be classed as crabs, even if too high to tame. **Note: it's likely a mistake that the Mountain Hawk from Stormsong uses the condor model, and it is quite likely a placeholder that was meant to have been switched to the 'birdsofprey' model once it was introduced. In which case it should stay a Bird of Prey, but change to the new model. - It's staying a BoP but switching to the previously unused red and black hawk appearance! Maybe should be Critters, or their models changed? Encrusted Kingscuttler (138896) is in Island Expeditions and shouldn't be tameable. Taming it actually halts progress of the scenario until it's dismissed. This is the only tameable IE NPC that we know of. Coati (131704) is flagged tameable but probably shouldn't be, since it's the pet of an NPC hunter. It's level 122 so can't be tamed yet anyway. The only thing that I might correct is the Golden Serpent. It spits gold during the fight, is able to control it, and its dungeom journal refers to it as being created (if I remember correctly). So it being an Elemental might be the correct classification. Ahhh ok. I hadn't read that, but it makes sense I guess it can't hurt to leave it on there for now and they can decide. I just remembered and added the iron juggernaut taming bug. Any others this list is missing? . Also: I had confirmation that Island Expeditions beasts should never be tameable so I won't include them in the taming candidates list. I've added the tameable Encrusted Kingscuttler to the bugs list since it's in IE and causes issues when tamed. I figured as much. Being able to tame the rares or elites could potentially ruin an expedition. Under Pterrordaxes, you say that the old models weren't updated. Why do you think they should have been? They're totally different versions of Pterrordax, just like the raptors have normal, Outland, Draenor, and Zandalar variants. They definitely shouldn't be unnecessarily changed to a generalized and newer look unless it's a faithful recreation, much like many other beasts got. Likewise, "and all are currently untameable" is incorrect; the two found in Un'goro Crater (non-instanced) are tameable. I have the green one as one of my favorite pets. You're right about that tameability line - I'm not even sure why that was there, thanks. As for switching to the new model, they can decide what they want to do, but I'd say it's clear that three of the new colours were intended to match the originals and so it's probably intended for them to be upgraded. And they're a much closer fit than many of the creatures they forced to fit the new models. Anyway, they're there so the designers can decide. The original is very low poly, and is not much more than an old bat with a different head stuck on. The hind legs of Wyverns and Wolfhawks (particularly the hind right leg) look broken near the ankle. This one has been around for a long time, but nonetheless should be fixed. The new mech parrot has an animation issue around its feet. When it is using its idle flying animation, these two "bolts" keep popping in and out of its feet. I am not sure if this is a problem restricted to the saddled version or if both the saddled and non-saddled versions have it. The truth did not know where to put it. First and as always, ask for forgiveness for my English as an automatic translator. I wanted to inform that the Ji'arak Broodling (Purple Pterrordax http://www.wow-petopia.com/look.php?id= ... ax2_purple) ingame if they are marked as tameable, only that they are 122 and we 120 and we have to wait but it seems that we can have purple flying babies that if waiting to be higher than nvl and touch the boss to make an appearance. Thanks I've put that in the notes for that pet: "This pterrordax is flagged tameable but its level is currently too high." The remaining stuff is either not fixed or hasn't been checked yet. The Albatrocity WQ was up in Boralus today, so I could check on the Agitated Albatross - in 8.1 it's a Bird of Prey like the others. That means all albatrosses are now checked and only the Brinebeak one is in the wrong family. I also ran into Kil'Tawan, a giant tan direhorn in Zuldazar. She's tameable in 8.1. Oddly, she was up despite her associated world quest ("A Nose for Ptrouble") not being present, so maybe she spawns all the time in 8.1. They have made at least one other NPC change to that area in 8.1 (added the N'Chala the Egg Thief) so maybe they changed her as well. I'm not sure if there's something else going on in that area in the new patch. She isn’t always up. I checked for her the day that the build deployed and I could’t find it. It looks like she always could spawn without the WQ, but it was random. Maybe it's just mine but sky screamers seem to have the running sound of mechanicals. nvm apparently with animal companion unlike hati who was dead silent as was my mechano wolf who only used to do annoying growls every 10 seconds now they have a really loud walking sound to let you know their walking, so its not the sky screamer.